Joining a gym is a big commitment. And for some people who are losing weight, the decision is intimidating. You need to make an informed decision and consider some important factors before you make the financial investment, sign on the dotted line and join a gym. Which Gym Should You Join? The most important factor in choosing the right gym is finding one that fits your personal needs and goals. You should think about why you want to join a health club. Are you trying to lose weight? Are you managing a physical injury? Are you trying to improve your performance in a particular sport? Look for a facility that offers the most classes and services to meet your needs. For example, if you have arthritis, a facility that offers water aerobics classes will be preferable over one that does not. You may want a gym that offers personal training or nutrition counseling for weight loss. Be sure that you get a complete tour of the facilities and ask questions about the services offered. Are Personal Trainers Qualified? Many gyms require that their trainers achieve and maintain certification from an agency such as the American College of Sports Medicine or the American Council on Exercise. Ask if the trainers and instructors are certified by one of these organizations or a similar one. You may also want to ask if the nutritional staff is qualified. A registered dietitian (R.D.) is your best resource for getting personalized meal plans. A gym with qualified staff is preferable over one that does not have requirements for its staff. How Do Classes Work? Are classes included in your monthly fee, or do you have to pay an additional fee for them once you join? Do you have to reserve a spot in advance? Does the gym offer classes for beginners? How crowded are the classes? You may want to take a sample class before you join a gym if you think you'll be using the facility's group fitness offerings. Is the Gym Clean? 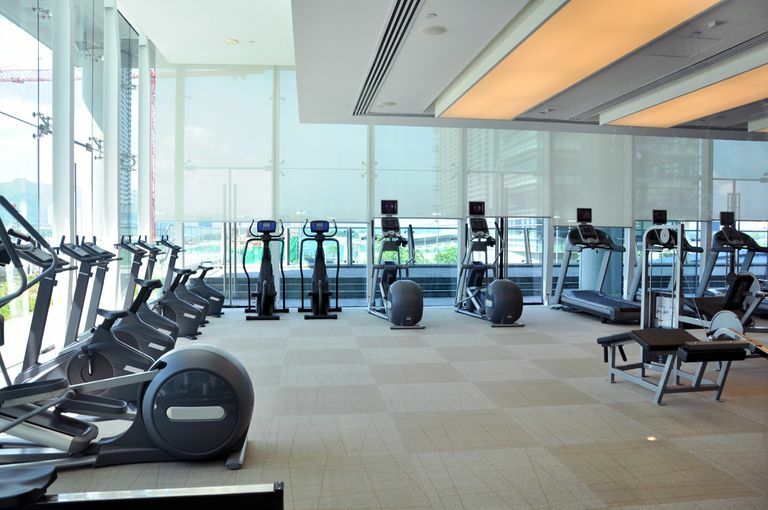 When you tour the gym, you'll want to check for cleanliness in the weight room, the exercise rooms, pool area and especially in the locker room and showers. Be sure to look closely at the equipment. Dust piled up beneath or around the exercise machines is a sure-fire sign of poor maintenance. Check out the lockers, inside the showers, and around sinks and toilets to make sure they are cleaned on a regular basis. What Are Peak Times at the Gym? If you plan on using the facilities at approximately the same time each day, you may want to scope out the situation before you join. Is the parking lot packed at your desired gym time? Is there a line to use the treadmills? Joining a gym won't do you any good if you can't use the machines you need. Before you sign a gym membership, it doesn't hurt to check with your local Better Business Bureau to make sure there have been no complaints about the gym you are considering. This extra step may save you hassle in the long run. It's also helpful to shop around and compare contracts, special offers, and limitations at different gyms in your area. Be sure to inquire about student, teacher, or senior citizen discounts if you fall into one of those categories. Also, ask your employer or health insurance company if you're eligible for any gym benefits. Next, when you're presented with the contract, do not sign it on the spot. Resist high-pressure sales techniques and don't sign anything until you've had a chance to go home or another quiet location and review the terms. Even better, have someone else read over it in case they spot something you don't. Most gym contracts are nonrefundable. While a few exceptions can allow you to cancel a gym membership contract, it's usually not very easy to cancel once you've signed on the dotted line. Your membership will have to be paid whether you're using the facility or not. Ask about cancelation just in case you need to leave the health club. Lastly, be careful about signing a long-term contract. While paying in advance will probably get you a better rate, most experts agree it is preferable to pay month-to-month. Once you've joined a gym, it's time to lace up your sneakers and start working out. Don't worry if you're going to the gym for the first time. It's easy to look like a pro if you know what to do and what not to do. Don't be afraid to ask questions and take advantage of services for newbies. Your gym membership is an investment in your health. Take the time to make a smart decision for long-term health and wellness.